After exploring the holy Chamundeshwari temple, we were all set to explore other places of sightseeing in Mysuru. Next on our cards was Brindavan Gardens. The Brindavan Gardens is world famous for its symmetric horse shoe design. It is one of the most beautifully laid out terrace gardens in the world. 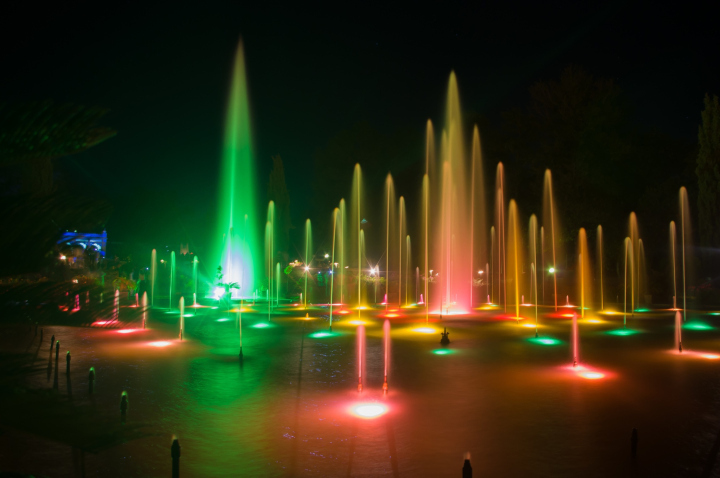 The gardens have been modelled on the design of Shalimar Gardens, Kashmir. 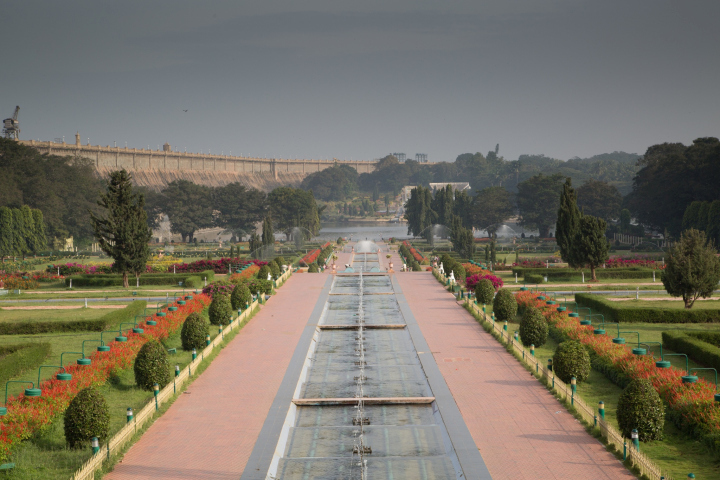 The creation of this garden in the Krishna Raja Sagar Dam site has been the achievement of Sir Mirza Ismail, the then Dewan of the princely State of Mysore. Krishna Raja Sagar Dam is visible from very far off and looks stunning. The dam is built across the river Kaveri. Brindavan Gardens can be visited on any day from 6:30 am to 9 pm with an entry ticket of INR 15 for Adults (INR 5 for children). After you enter you will be welcomed by colourful gardens, a variety of flower pots and a long pathway to the fountain area of the garden. 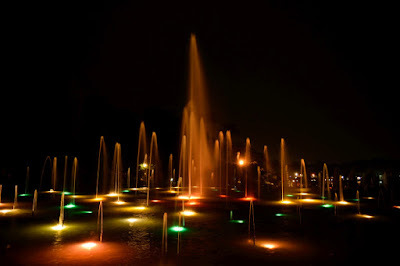 After reaching the fountain area, you will be astonished to look innumerable fountains. 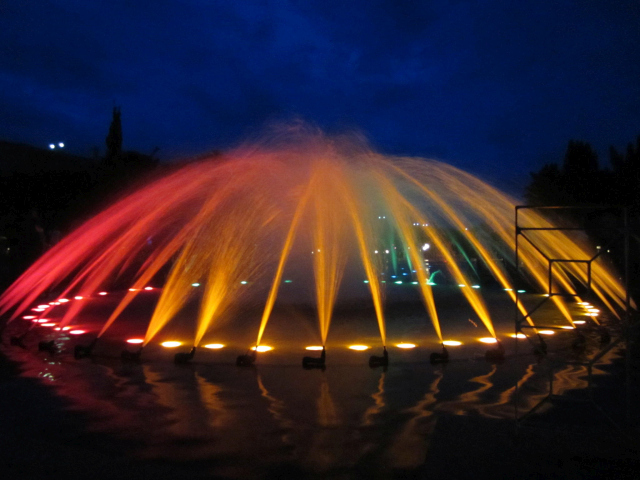 These fountains are decorated with coloured lightning. 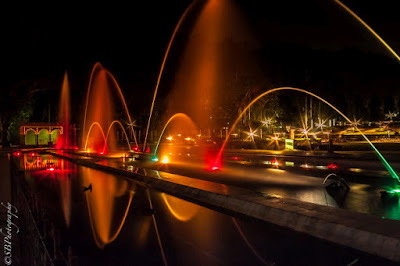 The illuminated running waters and fountains with changing colours of lights is an event that you should DEFINITELY look forward to in the evening. (Sound and Light show). We saw many women workers cleaning the water basins near the fountains. You will appreciate the cleanliness and the maintenance of the garden. The garden has many open spaces, lawns, illuminated flower beds and ornamental plants. It also has well laid out roads and pathways. If you are planning to visit Mysore, make sure you visit the Brindavan Gardens both in the morning and evening. Daytime beauty of gardens and evening sound and light show will be a lifetime experience (Evening Light Show timings: 7 pm to 8 pm). More than 20 lakh people visit the garden annually. You can also enjoy boating in the lake area which is in the midst of the garden only. Ek group pic ho jaaye! Although we didn’t get a chance to visit the gardens in the night, I am attaching some pictures of the light show of the fountain area from the internet to give you a glimpse of this night beauty. 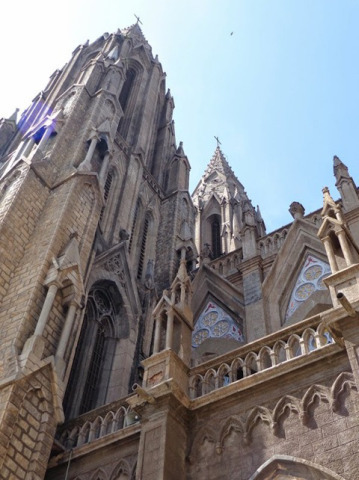 After the beautiful gardens, we went to St. Philomena’s Cathedral Church. The church is more than 200 years old and is one of India’s largest and oldest church. It is built in the Gothic Architectural style with beautiful stain glass windows and lofty towers. The illuminated church in the evening is a wonderful site not to be missed. Church can be visited every day from 5 am to 6 pm (Free Entry). Photography is prohibited inside the church. The twin spires of the church (175 feet in height) towering over the trees and the houses will grab your attention from a distance. 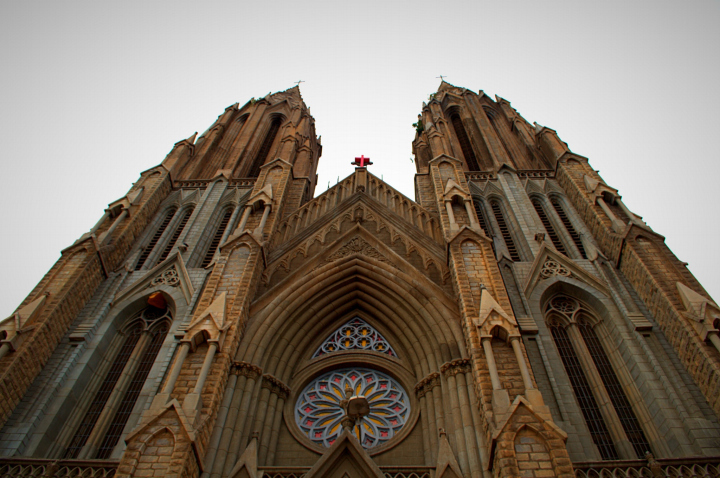 An interesting part about the church’s architecture is that its length and height is identical at 175 feet. Gaurav and Ankit at the church !! Next on the cards was Mysore Palace. We had visited the palace yesterday night when it was lit up bright. Now was the time to explore the beauty of the palace from inside. The entry ticket can be purchased from left and right windows at the visitor entry gate which is also the southern gate (also called Varaha gate ). The main entrance gate is called Jayamartanda. This gate is opened only during the Dusshera festivities or any such other occasions when the royal descendants use it. Group pic in front of Mysore Palace!! 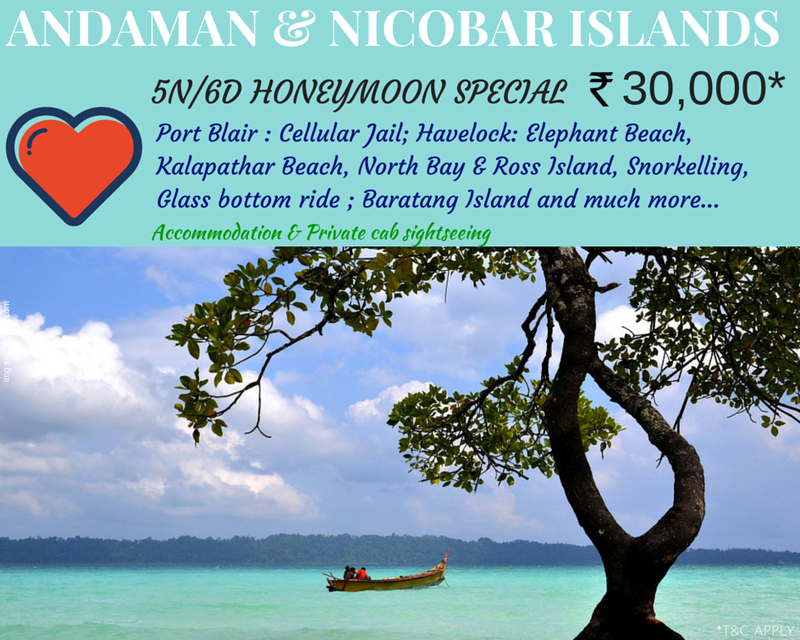 The cost of the ticket is Rs 40 for Adults (INR 20 for children). You have to submit the camera and the mobile phones in the locker as the same are not allowed inside the palace (No charges for the same). After removing the shoes and going through the security check we entered the huge halls of the palace. There were beautiful paintings all over the walls. These paintings depicted the Dussehera festivities as observed since the Kings ruled there. Then we came upon the most beautiful wedding hall -the Ceremonial hall or the wedding pavilion or the Kalyana Mantapa. Its octagonal shaped and has the most exquisitely carved and painted columns in turquoise blue, gold and hints of red. The flooring too has English mosaic tiles in a peacock pattern. Infact, all over the palace, the floors have been laid with such exquisite mosaic tiles. The opulence of the wedding hall is repeated in the Durbar halls – public and private. 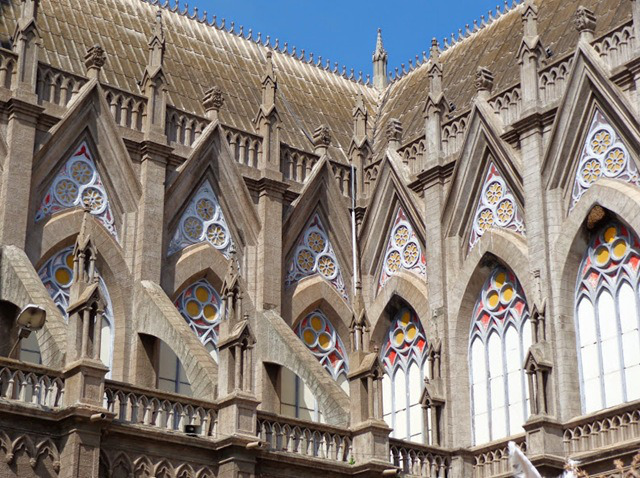 The beautifully carved and painted columns echo in symmetry with graceful arches. Semi-precious stones inlay work; beautifully carved Burma teak ceiling, sculptures and paintings – all enhance the beauty of this palace. The Diwan- e- aam or the public durbar hall has huge panels of paintings of ten incarnations of Lord Vishnu, which are further interspersed with huge chandeliers. The columns here are gold and green and tower magnificently, visually leading to the main gate. The Diwan-e- khas or the private durbar hall was magnificent in splendour and colours. The sheer opulence and workmanship in this palace will astonish you. Shwetha Varahaswamy Temple, dedicated to Lord Varahaswamy, one of the 10 incarnations of lord Vishnu is one of the 12 Hindu temples located in the Mysore Complex. Next we went to the shopping complex and purchased some soaps, agarbattis and some other gift items for our friends and family. The sun was setting in and it was time to bid adieu to the beautiful city. 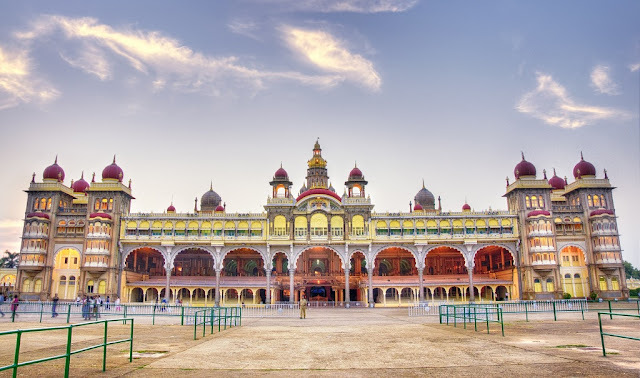 Mysore is the only place where you must visit every place twice – once in the morning and then in the evening. In our next blog we will take you through one of the most adventurous “night” roadtrips of our journey – Mysore to Ooty via Bandipur Wildlife Sanctuary.